Bruno Mattei, a name in cinema associated to schlock. Some would say this man is on the same level as Edward D. Wood Jr.; I think that comparing these two is dishonoring Ed Wood. While Eddy craved attention and the life of a director Mattei craved only money. He cashed in on the biggest crazes by making poorly-shot knock-off flicks, much like the despised Asylum Studios. 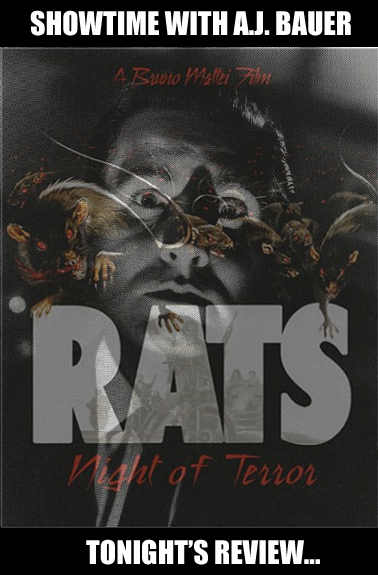 Tonight I shall endure the mental anguish brought on by one of Mattei's films, RATS - NIGHT OF TERROR! I shall delve into this film with little to no knowledge. Will this film be hilariously poorly-made schlock or a display or idiocy that will plunge me into mental anguish? Tonight, we shall know. Today, I will be accompanied by a guest. My dear cousin Joshua John Bauer. He was with me for Mac & Me and Pervert! and now he's come to assist with tonight's viewing. Bit him fair welcome, and good luck. Hmm... looks like the kind of film I like. Good luck to you on this. Start - Oh god! Pick a dub! Jesus, my poor ears! 0:47 - You expect me to pay attention with this dubbing? 2:08 - Lucifer? I figured I was in Hell. 4:00 - Really? Do you need the epic music for the guy taking his gloves off? 4:35- What kind of gun is that?! 5:26 - The patrons probably cleared out when they found out Bruno Mattei was shooting a movie in the bar. 6:13 - Again with the dub! If you're going to dub a movie you can't play both the original audio and the dub at the same time! 7:55 - Aaaaaaaand how long are we holding this shot? 8:22 - Let's hope there isn't a crystal skull inside. 9:52 - I GET IT! YOU FOUND FOOD! I'm happy for you! SHUT UP!